Valkyries, from Norse mythology, are "the chooser of the slain." This comes parts of the Old Norse name valkyrjur with valr meaning "slain on the battlefied" and kjósa meaning "to choose." These warrior women are an ingrained part of the mythology and viking culture. Valkyrie are fierce women, with blond hair and tall build. Wielding a gilded shield and a sword, trident or spear as their preferred weapon, they are viewed truly worthy of welcoming any brave warrior to Valhalla. They select only the most heroic of the fallen and bring them to Odin. When not on battlefields, the valkyrie served mead to the fallen in Odin's great hall. They also are usually described as the lovers of great warriors. They are associated with swans and can even shapeshift into them. While depicted on various amulets from the Scandinavia to the Germany, the myth of valkyries (as well as Old Norse runestones and traditions) has traveled far beyond those regions with the Vikings, even becoming part of other cultures. Some believe that the origins of the valkyries point to demons who hunted the souls of the fallen and captured them for slaves after battle. Others claim they are the female personification of death, who reaps the souls from fallen men. 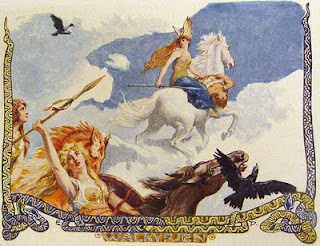 Valkyries aren't an entirely new subject on my blog. For more information, check out Into the Paranormal: Fylgjur and Valkyjur. Your turn! What do you think about Valkyries? Have you read, watched, or played something with one in it?